One of the more fun things for kids and adults alike is dressing up in a costume. For a few hours we can become a different person, or an animal and even an object. The best costumes are those you sew yourself. Homemade costumes fit better, are of better quality and can be handed down. Make lasting memories of loved ones dressed as a alarm clock, sweet angel, scary vampire, baby pumpkin, puppy dog and tons more. If you can think it you can most likely find it here among all the costume patterns listed below. Also visit our Halloween patterns page for cool designs for around the house. Here is an assortment of great costume ideas that are inexpensive or cost nothing at all. Have fun showing off your sewing talents with one or more of these fun and easy to follow projects. Kids love to dress in their favorite costume and go trick or treating. 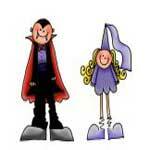 Here are tons of costume patterns for both boys and girls. 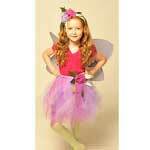 Browse through this large selection of costumes with your little trick or treater. You can easily make the cutest animal costume for baby or toddler with items found around the house. A black sweatsuit can become a skunk, with a dog collar and a hooded shirt you can make a sweet puppy, plus many more. 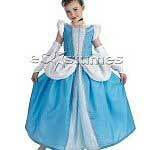 Choose from a large selection of costumes for kids and adults. With this many patterns you can easily find one for every member of the family. Great ideas for family and group costumes, costumes for the disabled and others. 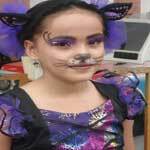 Learn how you can make the best Halloween costume using old clothing and other items around the house. Here is an easy to follow pattern to make these adorable cat & mouse ears. A great project for any beginner to do. A cool part of a Halloween costume. Just a basic mask to print and cut out. Simple instructions to make a pair of elf shoes to go with an elf costume. Have Christmas on Halloween by making a Christmas tree costume. This cap can be made with white poster board or with fabric. A baseball costume that has a large baseball in the front and back - really cool. Kids just love super heroes and here is how to make your child a Superman costume. Angel wings and a skirt made of white tulle, makes this a very angelic costume.